A 10-year-old Rhode Island girl has died from complications of an unusual respiratory virus that has been affecting children across the U.S., state health officials said Wednesday. 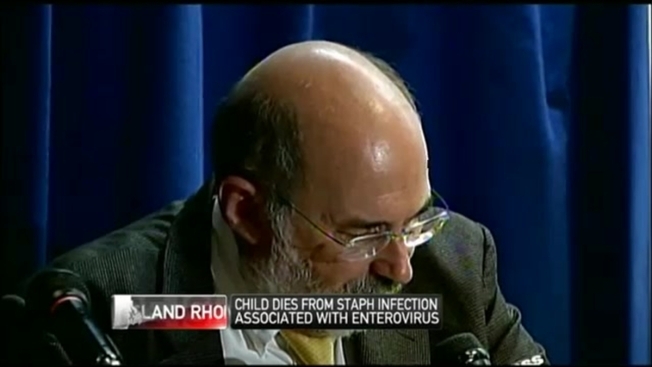 The Rhode Island Health Department said the child died last week of a staph infection associated with enterovirus 68, which it called "a very rare combination." It's unclear what role the virus played in the death, Health Director Michael Fine said. Fine said the girl was from Cumberland and was taken to Hasbro Children's Hospital in Providence when her parents noticed she was having trouble breathing and called 911. He said the situation quickly "became dire" and she died within 24 hours of arriving at the hospital. He said she did not have any previous infections or an underlying disease. The Cumberland School Department said the Health Department told school officials Wednesday that a student had died of a staph infection associated with the enterovirus 68. The school department it is monitoring the situation. The Centers for Disease Control and Prevention says enterovirus 68 sickened at least 472 people in 41 states and the District of Columbia. Almost all have been children. Besides the Rhode Island case, federal officials have detected the virus in two other patients who died, but again say the virus's role was unclear. The government released no other details about them. The virus can cause mild to severe illness. The strain isn't new but it's rarely seen.